Not just a huge collection of Shark Pictures: Elasmodiver.com contains images of sharks, skates, rays, and a few chimaera's from around the world. Elasmodiver began as a simple web based shark field guide to help divers find the best places to encounter the different species of sharks and rays that live in shallow water but it has slowly evolved into a much larger project containing information on all aspects of shark diving and shark photography. 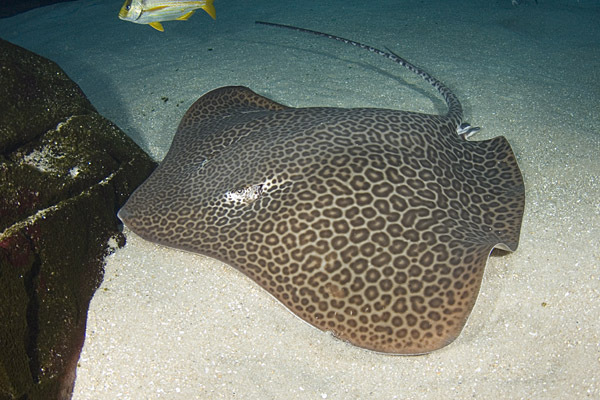 Common Names: Leopard whipray, Leopard whiptail stingray, Leopard whiptail ray, Bleeker’s Variegated Whipray. Scientific binomial: Himantura undulata, Trygon undulata (synonym). Identification: A very large whiptail stingray with a bold pattern of irregular jaguar-like spots. Rhomboid disc with rounded tips. Anterior margin of disc almost straight. Snout obtusely pointed, tips of pectoral fins rounded. Dorsum pale. Habitat: Found inshore in sandy bays. Sometimes found adjacent to rocky reefs. Abundance and distribution: Indo Pacific region from Bay of Bengal to Northern Australia. Absent from western Indian Ocean. Behavior: Rests in shallow bays partially covered by sand. Reproduction: Ovoviviparous. Embryos are initially fed by yolk sacs. Once the yolk is absorbed the developing young suckle from villi; structures on the wall of the uterus that deliver uterine milk. Conservation Status: Listed as VULNERABLE by the IUCN. This species is commercially valuable; throughout Southeast Asia and parts of the Indian Ocean it is taken as utilised bycatch of a range of commercial and artisanal fisheries including demersal trawl and tangle/gill nets, dropline and longline fisheries and Danish seine fisheries. In recent decades, demersal fishing pressure has increased in both capacity and effort and is intense throughout this species’ inshore range in Southeast Asia and parts of the Indian Ocean. Fishing pressure is also very heavy in the Arafura Sea region; previously more than 600 trawlers operated and although the numbers of currently active trawlers is unclear, there are still high levels of Indonesian trawl fishing in the area. This level of exploitation is of great concern to the sustainability of Bleeker’s Variegated Whipray populations in the Arafura Sea. This species’ preference for inshore coastal waters means it is also threatened by extensive habitat degradation and destructive fishing practices throughout a large part of its range. Although species-specific data are not available, given the species’ high levels of exploitation, extensive habitat degradation and its large size, significant population declines are suspected to have occurred and are likely to be ongoing across large areas of its range. The species is assessed as Vulnerable on the basis of suspected declines as a result of high levels of exploitation and habitat degradation in large areas of its range. This assessment should be revisited if and when there is any new taxonomic information and/or distributional information as this may affect the fishing pressure to which this species is exposed. Similar species: The leopard whipray shares some of it's range with the honeycomb whipray Himantura uarnak which can be distinguished by a pattern of much smaller spots. Reaction to divers: Probably difficult to approach. Diving logistics: Most images taken in the wild of leopard stingrays indicate that it is most often seen in Queensland Australia.